My relationship with Facebook has evolved from casual distain to abject masochism. Perhaps your feeds are vibrant, informative and thrilling. Mine is full of people expressing apparent shock and indignation that Tesco are already selling Easter eggs. “WTF!” they breathlessly exclaim. As though the basic principles of capitalism have come as a surprise. Same thing happens at Christmas; “OMG crackers in ASDA in October!” And again if they have a glass of wine on a Tuesday; “Look at me! On a school night as well!” Indeed, you are a counter-cultural renegade. Don’t people get board of pointing at themselves in the same way day after month after year? The worst is Brexit. I read the other day that an acquaintance of mine had “finally had enough”. Before offering their solution to the governmental impasse as a pedestrian checklist. What I particularly like/hate about this last example, is the complete lack of self-awareness exhibited. As though now this individual had “had enough”, it was time to stop messing about and sort it out. I briefly tried to strangle myself, but just carried on scrolling. 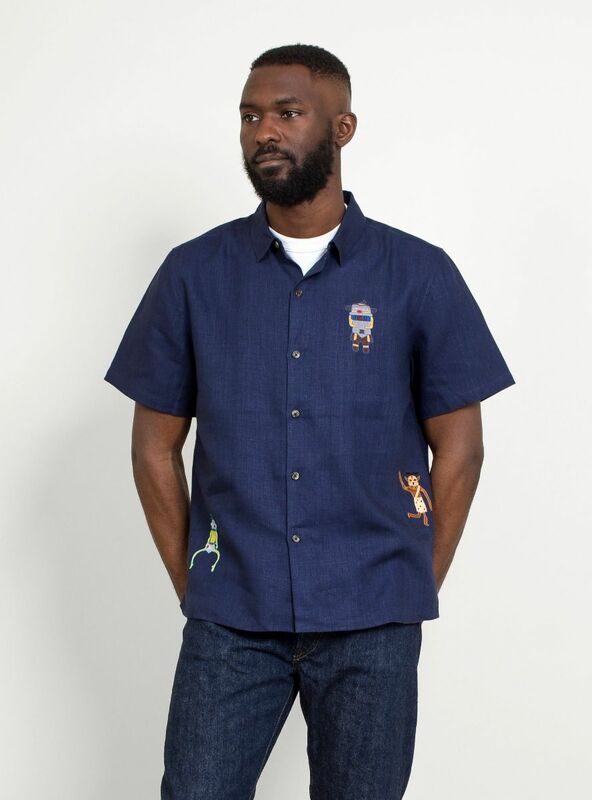 It’s by Jupe By Jackie, a brand known mostly for womenswear, but here it is over in the men’s section at Garbstore. The label is based in the Netherlands and primarily offers goods defined by embroidered detail. Their products remind me a bit of those Bruta shirts you can find over at Present. 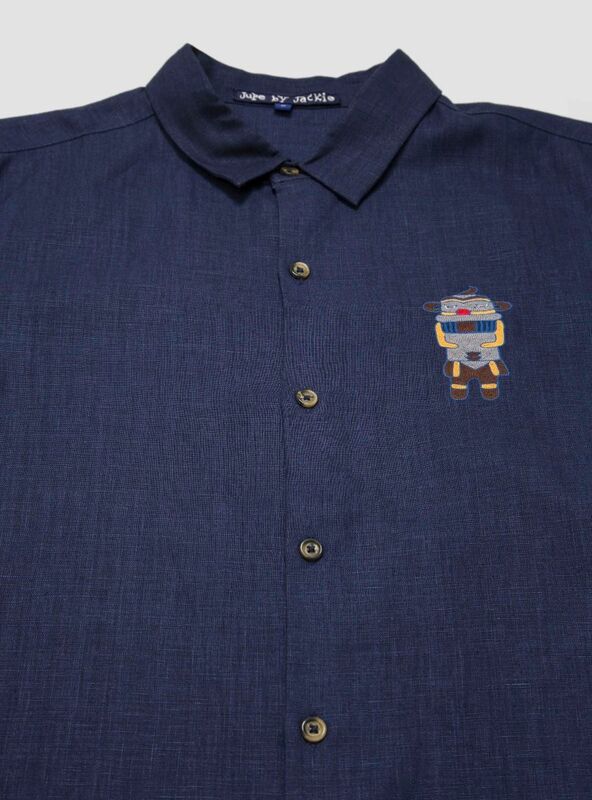 Anyway, this shirt is summer-ready in linen and features what appears to be a sort of robot-bear thing, a dancing tribes-person and a bow-legged individual impersonating a Space Invader. If I’m honest with you, I can take it or leave it. In general I like embroidered detail very much. 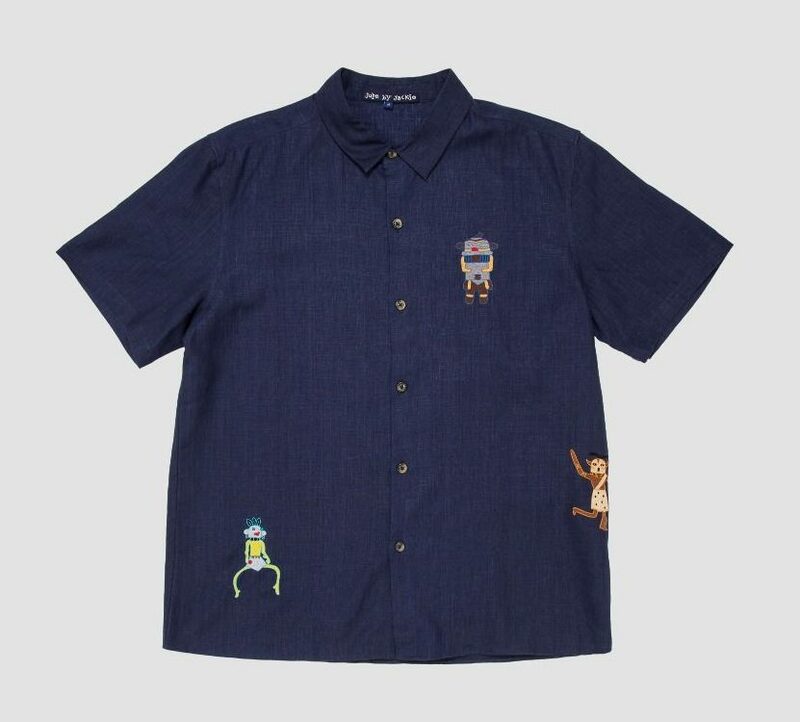 But random characters on a shirt? I dunno, it’s personal taste I guess. I’m just feeling a bit noncommittal right now. A bit lethargic. I’ve already been away from Facebook too long. I need to go back and get angry over someone’s generic baby pictures.